Before the 1960s it was pretty rare to find a whole hog anything outside of the Southern or Southeastern United States. As backyard grilling took off in the early days of the baby boom, so did the desire for smoked meat. 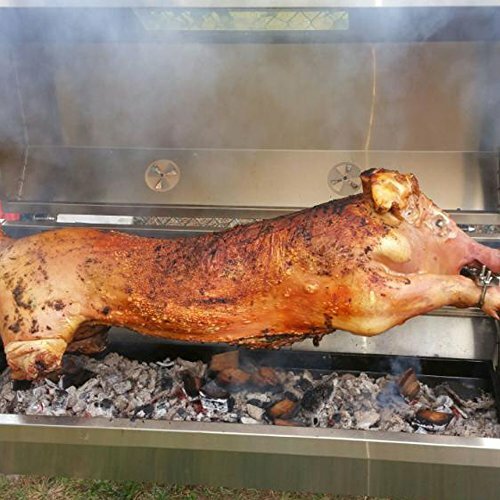 Still, whole hog roasting was relatively limited, and if you didn’t live in the South, you had to rent a special hog roaster. 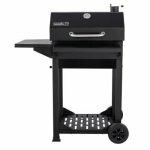 Today an increasing number of manufacturers like Titan is offering large scale charcoal-fired rotisserie grills that can also double as a smoker. The 899957 is one of their more popular models. It offers a 51-inch spit with a 25 Watt electric motor. In optimal conditions is capable of 4 revolutions per minute. 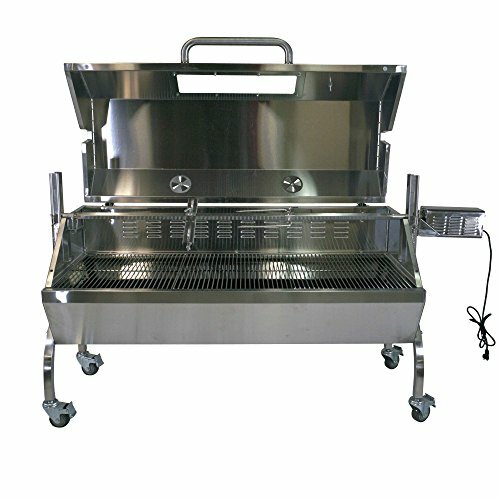 Titan claims it is capable of handling up to 125 pounds of meat on the spit. The spit can also be set to three different height settings, depending on what you want to make. The hood also has a glass window to allow you to monitor what’s going on inside the smoker, without having to open it and alter the heat to smoke dynamically. 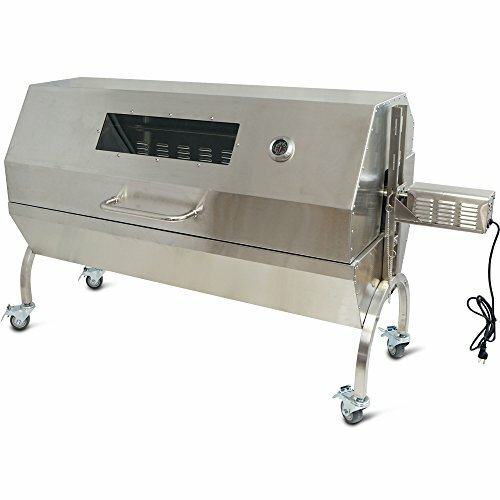 The Titan B018IVO9MM Rotisserie Grill Roaster is made from high-quality stainless steel to help with long-term rust resistance. 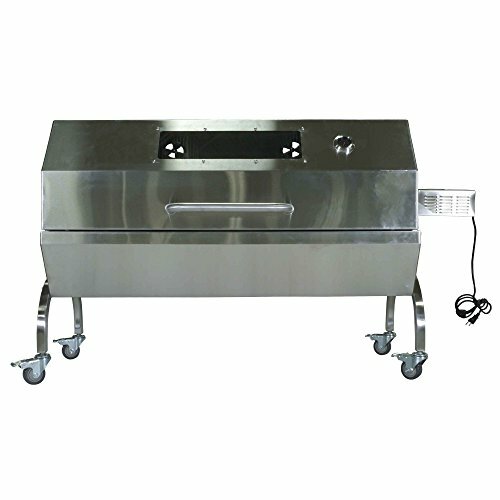 The locking casters also help hold it in place to minimize the inevitable wobble that comes when a rotisserie is spinning a large amount of meat. There are a couple of flaws in the design. When it’s fully loaded, the Titan 899957 Rotisserie Grill Roaster can be a little top heavy. This is somewhat to be expected with a large grill, with such a large meat capacity. Part of this is also related to the spit not having a proper counterweight. You might be able to adjust this by improvising your own counterweight. Just keep in mind that anything you add will inevitably decrease the percentage of the total weight the spit is capable of turning. There are a few ways to get around this foible. The issue is really all about the center of gravity when it’s fully loaded. Keeping some rated fire bricks in the very bottom, the front of the firebox will help balance out the weight issues. At the same time, the bricks also absorb heat, which makes for a more consistent cooking session. When it comes to assembly. There are a few fidgety bolts, nuts, and washer combos that you need to take your time with. Unless you have Herculean strength you absolutely will need a second person to help you fit the lid on properly. All told it shouldn’t take you more than two hours to fully assemble. There are a few different lenses to look through when it comes to evaluating the performance of the Titan 899957 Rotisserie Grill Roaster. Keep in mind the perspective of each of these is with the assumption that there are some rated fire bricks down low in the front of the firebox. As a standard charcoal grill, it offers a staggering amount of grilling area. It’s the sort of thing that will allow you to host the next church social, neighborhood block party or big family reunion. As a hybrid grill or secondary smoker, you can set up a fire on one side of the firebox to allow smoke and heat to waft over the meat. 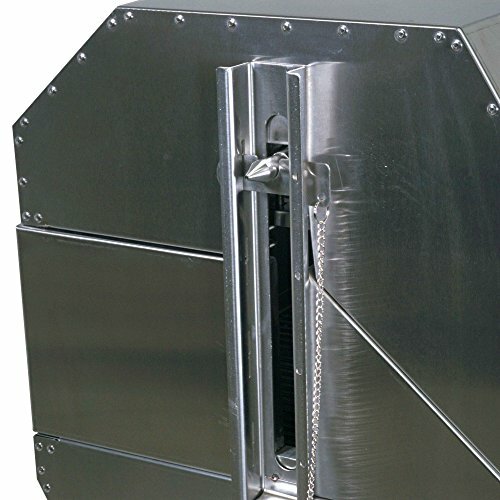 In this capacity, you can smoke a complete brisket or up to four pork shoulders. It’s when you use it as a rotisserie roaster that things get a little bit tricky. First off, the weight capacity Titan claims, simply isn’t accurate. 125-pounds is too much for a 25 Watt electric motor. It’s also worth pointing out that 125, even properly dressed out is not a “Hog” it’s a pig. In this case a young adult pig. To classify as a hog the porcine animal needs to have a live weight of at least 240-pounds! If you want to push the rotisserie to its realistic maximum capacity, then I wouldn’t go past a 90-pound dressed weight for a pig or a sheep/goat. Even then you should expect to have to trim off all the shanks to have any chance of it fully rotating. Now all this is not to say that the only thing the rotisserie is good for is large animals. A string of stewing hens or broiler-fryer chickens really takes on a lot of flavors. With a little careful engineering of the fire, you can even borrow an old French rotisserie technique and put a tinfoil pan full of potatoes under the string of birds to absorb the drippings! A larger beef roast like you would use for pit beef, or beef ribs wrapped in some chicken wire to hold them on the spit also take on some nice flavor. 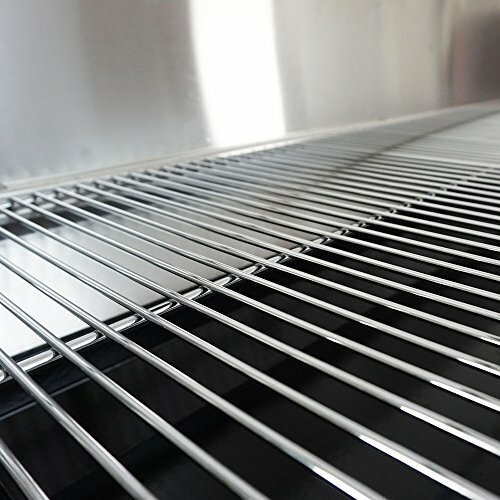 If you want to use it as a grill or a barbecue smoker, you have a staggering 1,400 square inches of grill grate space. 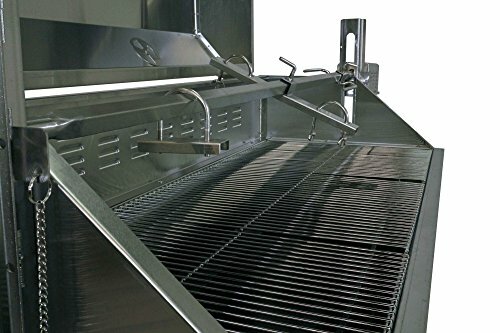 If you want to use the Titan 899957 strictly as a rotisserie, then the 51-inch spit can realistically handle up to 90 pounds of meat, or an animal with a 90-pound dressed weight. The 51-inch spit with the 25 Watt electric motor is meant to be the impressive feature that allows the Titan 899957 Rotisserie Grill Roaster to stand apart from being just a very large charcoal grill. Just don’t expect it to handle a true “Whole Hog” or anything over say 90-pounds of meat. Let’s face it, you are going to have to do a fair amount of ash scooping when it comes to cleaning any grill, smoker or rotisserie this large. The grill grates are stainless steel, which means they will also need some extra scraping. Every use or two as a smoker, you should take a little degreaser to the window to release soot buildup and residue. The Titan 899957 Rotisserie Grill Roaster comes with a 1-year limited warranty. If you are looking for a true Whole Hog rotisserie, this isn’t the unit for you. 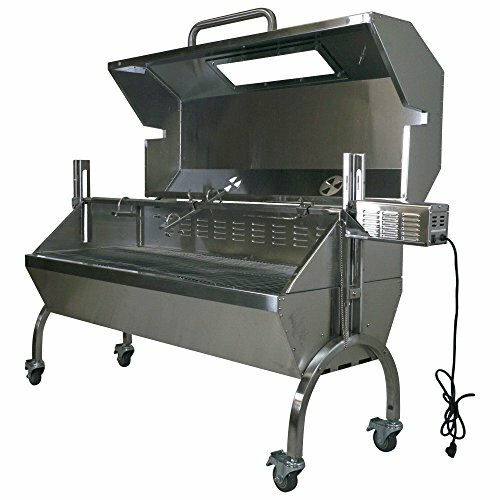 If you are looking for something where you can rotisserie roast a suckling pig, a spring lamb, or a large number of chickens, then the Titan 899957 Rotisserie Grill Roaster fits the bill. 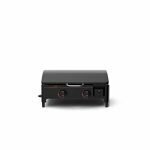 It also does a great job of just working as a charcoal grill or an improvised barbecue smoker. 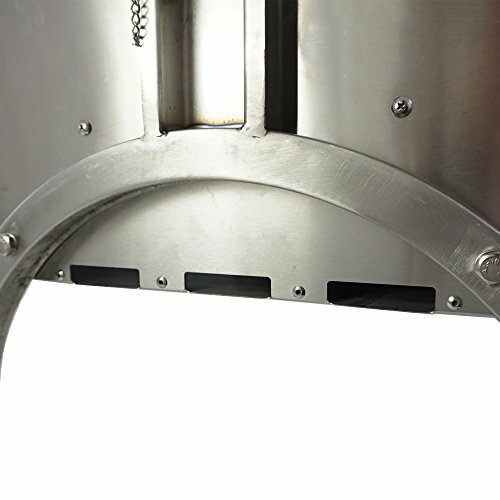 Hood with glass window for faster and cleaner roast - Saves charcoal by directing heat to the - Spit length: 51"
Motor capacity: 125 LBS. - Motor power: 25W - 3 tier cooking height adjustment. Speed: 4RPM - Material: Stainless Steel - Weight: 131 LBS. We need your phone number! For the trucking company to schedule delivery. Without it there will be delays!